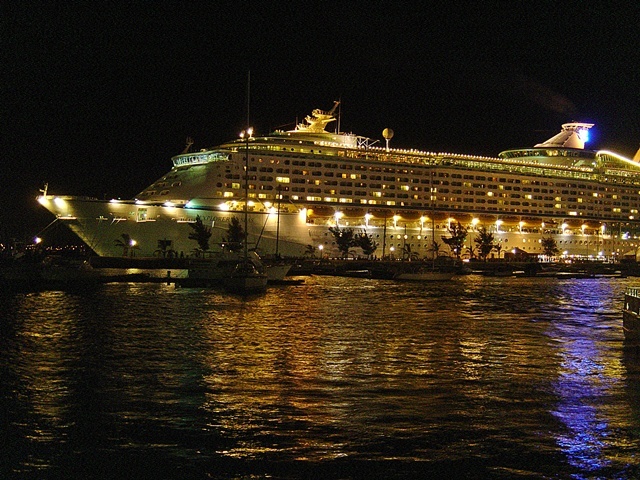 Explorer docked at King's Wharf, Bermuda! 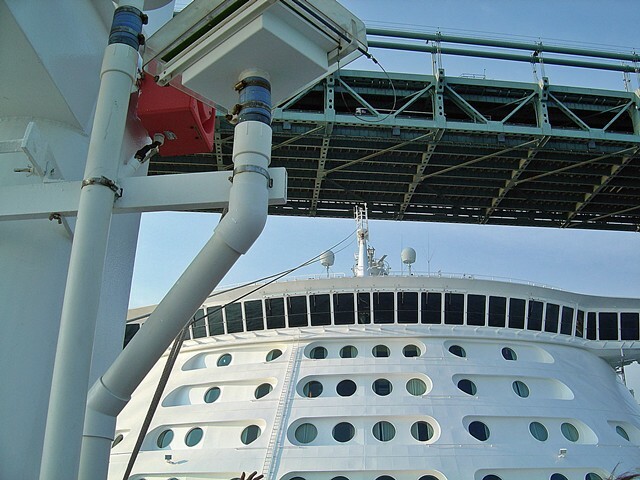 It's been 3 years since we last cruised on Explorer of the Seas, and a year since our port-shortened Bermuda cruise aboard Voyager. This cruise to Bermuda was PERFECT timing (even the crew commented on this: Ashley, Explorer's gracious cruise director, said we couldn't have picked a more perfect week!). Tucked between a series of hurricanes all headed towards (but mostly sparing) Bermuda that disrupted a few cruises here and there in this time frame, we had the best week of all as there were no threats in sight (although hurricane Helene did make for a spectacular beach day as she passed... more on that below). 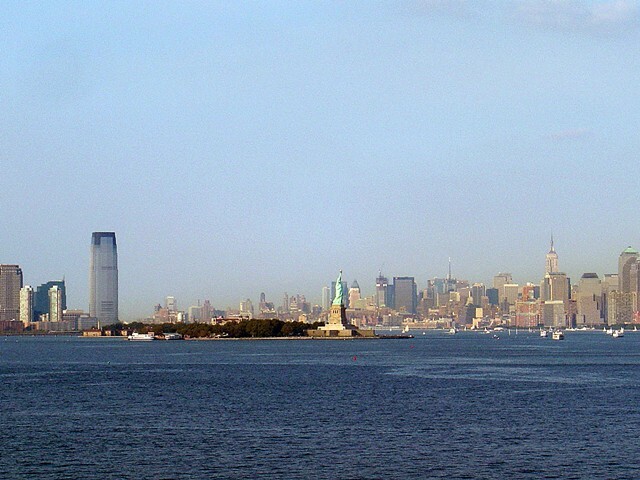 Late summer warmth at Cape Liberty, Bayonne, NJ gave us a sunny warm departure date on Sunday the 17th. We were onboard by 12:30pm... literally right from parking the car and handing the luggage over to a porter. 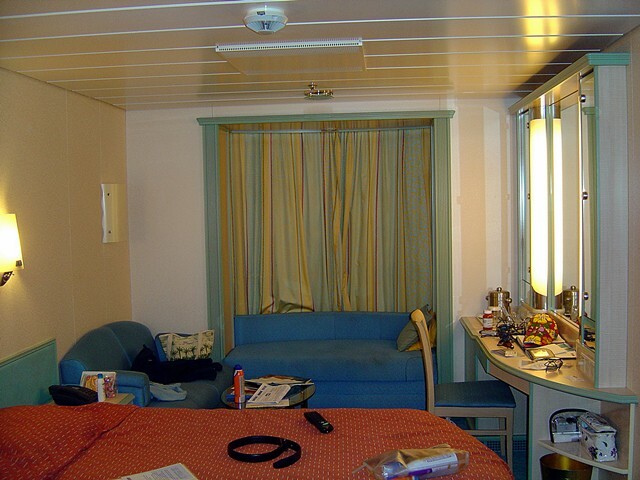 The cabins were off limits till 1pm as they were still being cleaned, but we saw a door that was left open accidently, so we decided to sneak a peek at our inside Promenade cabin as this was a first time experience in this sort of stateroom. It literally feels like an outside cabin with a big window box that you can sit in and watch the "street" below. Real cool. After this, our cabin steward (Robert) kinda shooed us away as the cabin wasn't really ready yet, and we scampered back to the aft stairwell. Our Inside Promenade cabin, after we moved in! On our way, we peeked into many different sorts of cabins... inside rooms, balcony rooms of differing sizes and some incredibly large outside rooms fore and enormous balconies aft. 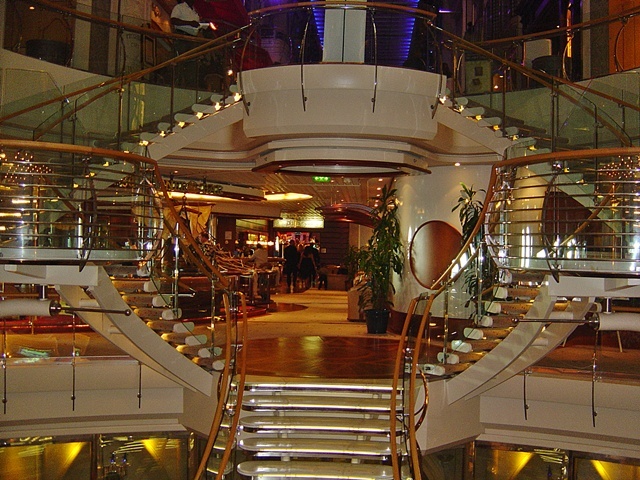 Once we rejoined the rest of the ship, we headed up to Portofino's and made our reservations for dinner for Monday night then we moved onto the Windjammer for the buffet lunch (it's sort of a ritual that once onboard you always head to the Windjammer to start stuffing your face). Nice food selections and tasty tidbits. We also noted (approvingly) the ship's emphasis on keeping the passengers and crew safe from viruses! Installed all over the place were hand sanitizing units that auto dispensed sanitizer with just a wave of your hand beneath them. (Update 2009: this is typical now across RCCL and Celebrity fleets) Nice touch... and I'd say 99% of the people were using them! Later we went back to our (now ready) cabin, and jumped into our trunks then sat by the wonderfully empty pool area. (*sometimes, the best time to get any spot around a pool area is embarkation day; many people pack their suits and have no access to them- or they're too busy trying to figure out the lay of the land. Diane and I are old pros, so we know what to do and where to go.) One older gentleman was sort of indignant that I was swimming while he "was still waiting for his <blanking!> luggage!" Oh, well. Approaching the Verrazano Bridge... Will we make it underneath? Hooray! Explorer just makes it under the Verrazano Bridge! 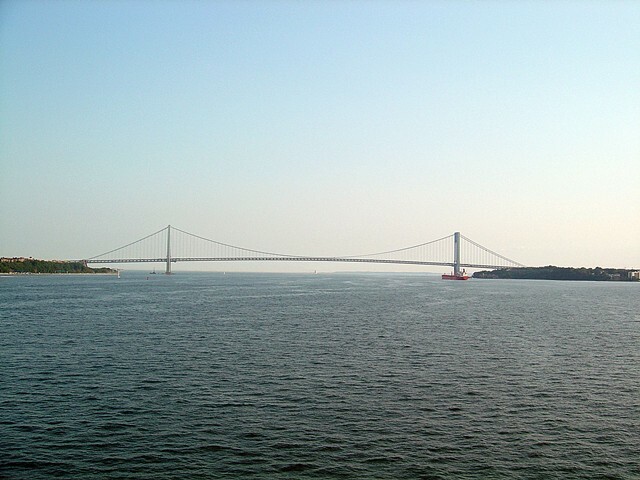 The day was gorgeous and we eventually went back and did the mandatory muster drill and then we got a spot at the bow for the passage under the Verrazano Bridge... always not to be missed on cruises from Cape Liberty. Dinner was a delicious prime rib in the main dining room! 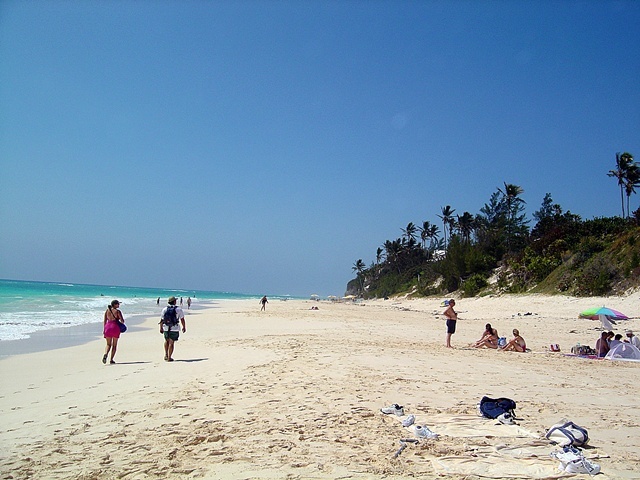 Tuesday the 18th we spent most of the day at Bermuda's beautiful, but secluded, Elbow Beach. 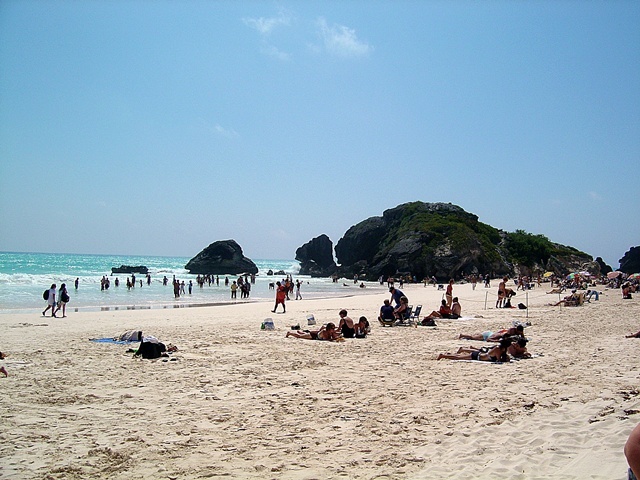 It took quite some time getting there and once there, you need to walk around the block and down a long but gentle sloping road to the beach. Elbow beach is pretty, but there's no real public facilities around (unlike Horseshoe Bay), so after a while, it gets kind of dull. 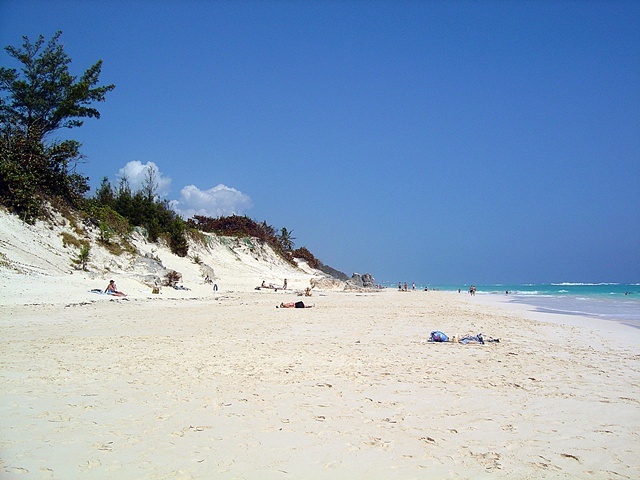 Elbow Beach looking in the opposite direction from the picture above. The ship left port on time... but then incredibly as it was pulling away, it pulled back up to the dock to let on some passengers that were late getting back (it's always amazing to me that someone usually manages to be late on returning from port! Unless they have a valid excuse like their cab broke down, I think they should be left behind. There's more then enough information on when you're due back). 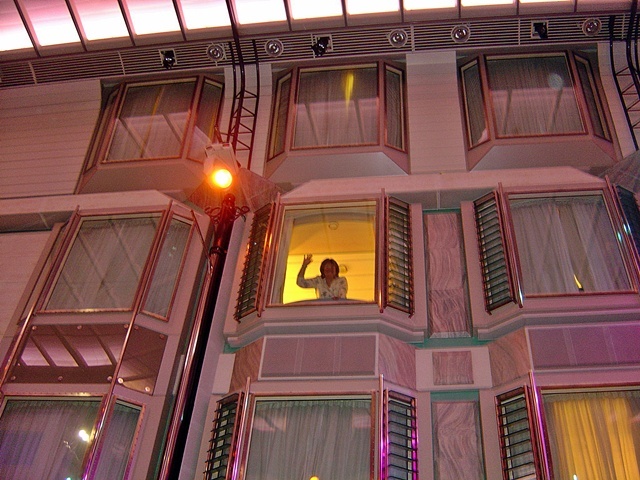 Anyway, they were met by people on the top deck chanting, "Let them swim!!!" ... all in fun. That night, we rejoined our table companions, Tony and Sarah (very nice couple on a free cruise he won!) in the main dining room and had a tremendous lobster feast. Thursday was another day at sea... sunny but very windy, so we did mostly ship exploring type of things. One of the first things we did was book our cruise for Liberty of the Seas next year with Russell, the Loyalty Ambassador. Then we went to a morning party for the Platinum and Diamond and Diamond Plus members where we ran into and Ron and Sue (Hello, RIbarfly!!)... 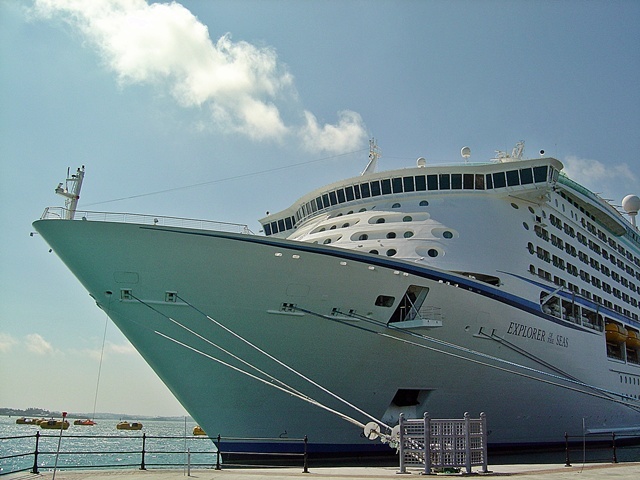 a great couple with lots of excellent advice even for "seasoned" cruisers like Diane and I. They were fun to hang out with. I'm glad we met them by chance at the Schooner Bar the day before. 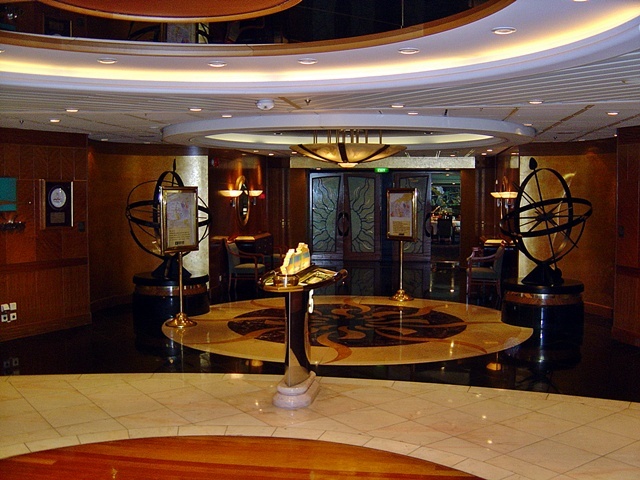 Later we had lunch in the main dining room and after that, we made the perfunctory donations to the ship's casino. We also worked out in the gym (time to start shedding pounds gained on Freedom and Explorer... again!) and started packing for the return on Friday to Bayonne. The balance of the day we laid in loungers by the Solarium's port windows and watched the ocean roll gently by with the sun setting in the west. Wonderful. Friday's disembarkation ran a bit behind, but once off the boat, we quickly found our luggage, rolled it out to the car and took off for home. What a great time!!! As for Explorer herself, well she does need some refurbishing here and there, and her main pool area flooring needs to be replaced in many places. Her Solarium needs some of it's fixtures to be repainted and some missing tiles need to be replaced. Overall, she looks like a six year old ship (which by today's ship standards is getting up there) that's seen some rough times. On the other hand as I said above, her food service is in many ways superior to the newborn Freedom of the Seas. I've never had such an incredible waiter as we had with Eduardo... he really needs to be a trainer of waiters! He's got the whole thing down to an art. 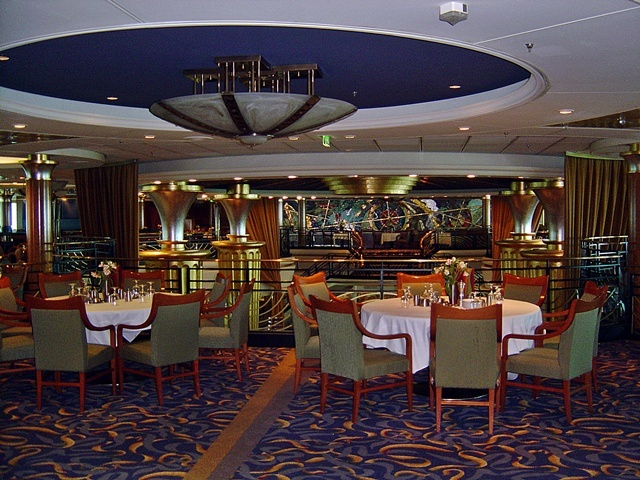 Meals in the main dining room while very very good on Freedom, were outstanding on Explorer.